Joint Base San Antonio-Lackland Reid Health Services Center has achieved Leadership in Energy and Environmental Design (LEED) Gold certification. Hoefer Wysocki, an architecture, planning, design and clinical technology consulting firm, collaborated with design-build partner JE Dunn Construction to create the new two-story, 70,088-sq. ft. medical clinic. It includes 19 departments and offers primary care, pharmacy, clinical labs and radiology services to more than 86,000 trainees in 130 units annually. The new facility replaces a clinic originally built in 1967. The new clinic embraced evidence-based design principles to create a patient-centered environment, improve the quality and safety of health care, develop a standardized, flexible and positive work environment for providers, minimize its environmental footprint and reduce life-cycle costs. Initially designed to LEED Silver standards, the design-build team of JE Dunn, Hoefer Wysocki, BranchPattern, Bob D. Campbell & Co., Land3 Studio, and BHC Rhodes brainstormed early and often throughout all phases of design and construction to incorporate additional sustainable elements. The U.S. Green Building Council developed the LEED Scorecard to provide a framework to design and construct healthy, highly-efficient buildings that also provide long-term cost savings. 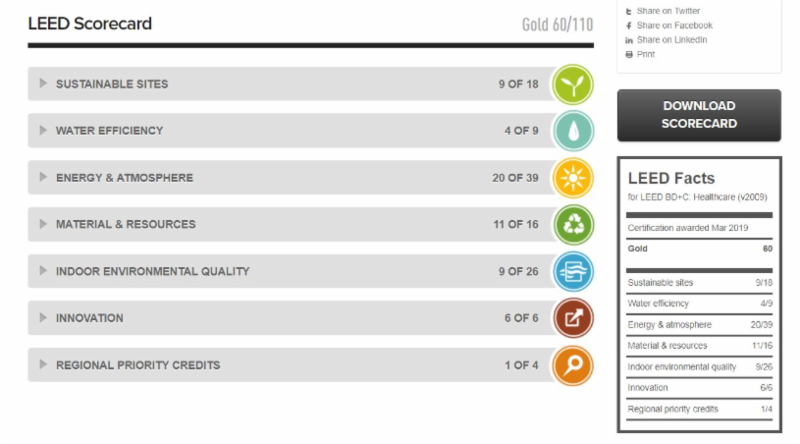 The LEED Scorecard is the most widely used green building rating system in the world – a building’s LEED certification is a globally recognized symbol of sustainable achievement. Earned a perfect score (3 out of 3 points) for alternative transportation-public transportation access. 100% of the building’s roof surface is solar reflective, reducing the heat island effect. Water use reduction was a key focus. Potable water consumption was reduced by 36.99%. Design yielded energy cost savings of 33.8%. Whole Building Energy Simulation achieved energy cost savings of 34.5%. Perfect score for sustainably sourced materials and products, construction waste management, Persistent Bioaccumulative and Toxic (PBT) chemicals source reduction-lead cadmium and copper, furniture and medical furnishings. 93.34% of on-site construction waste was diverted from landfill. 45.44% of building materials were sustainably sourced. Full points for outdoor air delivery monitoring, construction Indoor Air Quality (IAQ) management plan during construction: pre-occupancy, low-emitting materials, lighting systems controls, and thermal comfort design and verification. The new facility is one of 31 LEED Building Design + Construction (BD+C) Healthcare Gold certified projects in the world and only one of 21 in the U.S. It is an honor to earn any level of LEED certification, so to achieve LEED Gold is an exceptional achievement. It demonstrates that this new healthcare facility has made a commitment to the environment and the health of its occupants.